Water expands in volume by about nine percent when it freezes, creating a staggering force that can crack a boat’s engine block, damage fiberglass, split hoses, or destroy a refrigeration system overnight. 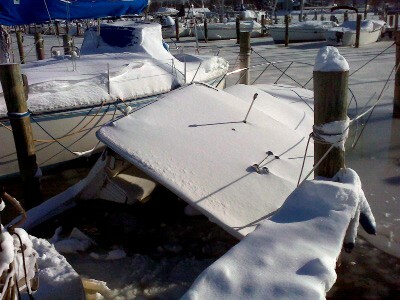 As cold weather approaches, Boat Owners Association of The United States (BoatUS) dug into its claims data and found that more than three-quarters of winter-related claims involved cracks in the engine block or exhaust manifolds. Now, the national boating services, safety and advocacy group is offering a free 15-page “Boater’s Guide to Winterizing” that can ensure boaters don’t miss a step for any type of boat. The downloadable brochure addresses the reasons for more than 95 percent of the freeze claims handled by the BoatUS Marine Insurance Program in the past decade. Included are chapters on Storing your boat – the options and the tradeoffs; a Winterizing Checklist to use as the starting point for creating your own boat’s winterizing list; Engines and Drives – The dos and don’ts; and Plumbing – Getting the water out. Additional information includes tips on choosing antifreeze, lessons learned from BoatUS Consumer Affairs about protecting yourself with a winterization contract, and green winterizing information. The checklist is available at BoatUS.com/winterizingguide.